HD Digital output cased camera, ideal for applications requiring direct-connect monitor viewing with High Definition resolution. 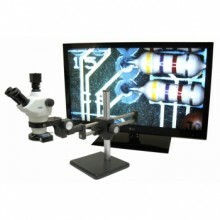 This CCD based camera outputs a true HD 720p, 16x9 image at 60fps. It also features the capability to program 28 individual DSP profiles and has a programmable on-camera push-button for manual control. Ball Bearing Boom Stand Base dimensions: 254mm x 254mm (10" x 10"),Vertical Post - 394mm, Horizontal Post - 585mm. Physical weight 42 lbs. 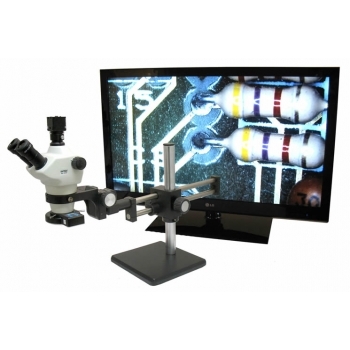 Click the button below to add the Unitron Z850 Stereo Microscope on Ball Bearing Boom Stand with HD Camera and LED Ring Illuminator to your wish list.